Not all petrol & oil companies issued their own road maps, especially in the 1930s when the American concept of the cheap and cheerful map, usually distributed free of charge to customers, was slow to be taken up in Europe. In particular, Italian motorists remained wedded to more expensively produced maps from the two main automobile clubs - the Touring Club d'Italia (T.C.I.) or the Automobile Club d'Italia (ACI), which prior to the war was known as the Reale Automobile Club d'Italia (RACI). Early maps were often surprisingly complex affairs. This Touring Club Italiano (T.C.I.) sheet 1 of Northern Italy dates from around 1926 and contained a simple enough map published by L.V. Bertarelli at 1:650,000 (but printed by Vallardi). It divided main roads into those wider or narrower than 6m, with some secondary roads of "special touristic interest" shown as well. Hills and undulating roads with lesser gradients than 4% were also marked. However the production was anything but simple. The map was mounted on stiff linen and folded into a cardboard pocket pasted inside cloth covered boards that fastened with a press stud. 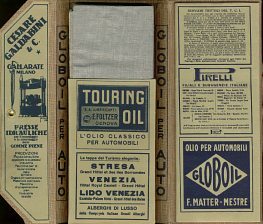 These carried adverts for three oil companies: Oleoblitz (Lubrificanti Reinach, of Milano) on the front cover, with Touring Oil (E. Foltzer of Genova) and Globoil (F. Matter of Mestre) inside. 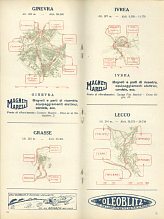 A 48 page booklet of town plans was pasted onto the right inside panel: this extended beyond Northern Italy into Switzerland and SE France and carried small adverts inside for Oleoblitz among other firms, as can be seen below the plans of Ginevra (Geneva), Grasse, Ivrea and Lecco. Oleoblitz survives as an Italian lubricant specialist; established in 1882 it was sold to Fuchs in 1970, but its automotive lubricants became part of the FL group in 1987. The fate of the other two oil company advertisers on this map is unknown, although Foltzer changed its brand name to the more Italian-sounding "Olio Turismo" in response to nationalist pressures, probably in 1938 or 9. Probably slightly later than the example above, this is also from a T.C.I. section 1 map of Northern Italy. There is a coloured Shell advert underneath a key map on the front cover , which also has a Michelin advertising panel. The rear cover (near left) includes a rather strange advert for Texaco Motor Oil, featuring two terriers. 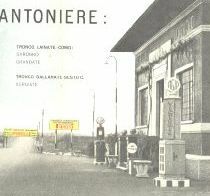 Internally, the adverts included a graphic page for Società Italo Americana del Petrolio, showing two 20 litre pumps in Lampo and Esso colours (although referring to the latter in the text as Standard), above a Motor Oil dispenser of "fluid", "semi denso" and "denso" grades. Shell also carried small adverts underneath town plans, indicating the address of the local agents - Lecco is shown here. Beneath the Shell ad were similar ones for other auto related businesses, including Magneti Marelli, Michelin and Accumulatori Dott. Scaini. The main map was now stapled in, no longer loose in a pocket. In the 1960s/70s T.C.I. maps commonly had simple adverts for TOTAL on the rear cover (genuine Total Italiana maps are much rarer), or sometimes Shell or BP. The RACI maps often included two or three logos or small images in the sea surrounding Italy promoting Shell, Esso/Standard and AGIP, which between them had nearly three-quarters of the Italian market. 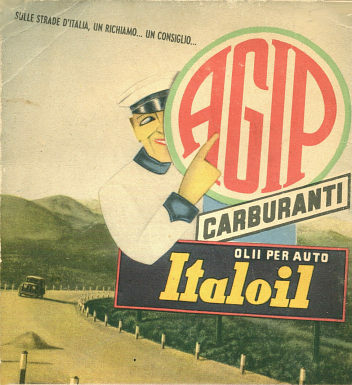 The Agip advert (left enlarge) comes from the top half of the rear cover of a 1939 Sectional map of Italy; no other petrol companies were on the map, although Pirelli tyres shared the cover. After the war, the advertising was removed from the map itself and was restricted to the covers, as in the graphic AGIP advert shown right. By the 1970s, ACI maps carried no third party advertising, although they did mark Agip service stations on motorways, as well as the small number of ACI branded service stations. This 1932 map of the Gardone Riviera (on the SE corner of Lake Garda, Italy) could be used by walkers as it is at the large scale of 1:25,000. As it carries many adverts for hotels, restaurants and travel agencies it would appear to have been intended for distribution to tourists before they visited, and this may explain the graphic Esso advert - the only one in colour - on the rear cover. Motorists in an open tourer look on amazed as a legionnaire bears the message "Esso il super [car]burante". 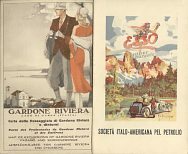 The map was prepared by Marenghi & Votta in October 1932, although the Esso ad was drawn by master watercolourist Aldo Raimondi (1902-98) in 1930. The AGIP pump shown here comes from a 1937 Pirelli Tyres autostrade map, quite possibly given away free to Pirelli customers. The pump carries the word Victoria on its side: this was the brand name of SNOM, a Russian-owned independent bought out by Agip. The "Road map of the Dolomites" (right) was issued for the local tourist board, but has 3 panels of Agip advertising which means that it is commonly incorrectly described on eBay as an Agip map. Inside card covers it has a high quality map by Baglioni of Florence. In 1960 the Italian Tourist Board (E.N.I.T.) gave away a basic Trip through Italy guide in English to aid travel to Rome Olympics. It included two small maps of the country showing main roads and rail routes, plus details of border crossings, train tickets, ferries, specialised repair shops, etc. Beware! It is sometimes advertised as an Esso map - it is not, but carries a single panel of Esso advertising, as well as one from Banca Nazionale del Lavoro. It is likely that German and French versions of this leaflet also exist. All original copyrights in logos and map extracts and images are acknowledged and images are included on this site for identification purposes only.